Funny, isn’t it? 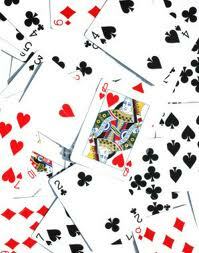 One can never imagine hearts being black and spades red! Well, this was something I found interesting when I saw the film Interstate 60 while browsing through different channels idly while sitting down to fold some clothes. I just about caught the scene where a man named Ray plays a small game with the protagonist using a pack of cards. He shows him different cards and asks him to name them while he slowly increases the speed of the game. The protagonist identifies the cards but as he is conditioned to think that hearts are always red, he mistakes the red spades for hearts. Quite true! We are conditioned for almost everything and seldom realise that we are slowly being sucked into the vortex of familiarity and boredom. Sometimes I allow myself willingly into assuming what certain words are by just looking at the first letter. I think that a certain word which starts with ‘e’ is examination when actually it is evaporation. A mental conditioning which sees the ‘e’ in the beginning and ‘tion’ in the end. Leave alone words, almost everything within us is so conditioned that we seldom venture into the unknown and the unseen. I find that this conditioning can be extended to food as well. One is wired to look for Starbucks, MacDonald’s and many such brands while looking for an eatery that the local and indigenous food is completely wiped out. Sometimes people find familiarity a comfort. It is a saving grace which enables them to stay protected. Why waste time looking for the unknown local joints, let us instead stick to what we know – Subway and Pizza Hut! Conditioned about colours, brands, words . . . I can go on with this but still some corner of me refuses to let go of the conditioning. I am a 20th century fox, you see! Susan, you are really unique I must say. The way you bring forward such things of our daily life into your blog posts is really awesome. Yes you are so true about the conditioning of words, colours and even may be our thinking. I do agree that we all want to be in a safer side by not wasting time or not taking risks. I agree with the first commentator, you are unique. I LOVE the way you see the world, or I guess *notice* it. Your reflections and contemplations are one of a kind. Yes indeed, I once saw a documentary about the way our mind guesses words, as long as we see the first and last letter, the middle can be garbled and still make sense. Lovely post as always, you never disappoint. I totally agree with you on this! We are really conditioned at a really early age to think things. I read this, and the first thing that I thought of was that game where you have to read the words that are printed in different colours. i.e. : YELLOW may be printed in RED. Blue may be printed in Yellow. But you have to read the words, and not the colours they are printed in. Very thought provoking, Susan. I loved this! hehe... 'I am a 20th century fox, you see!' Nice sentence. Okay first off, I agree we are all conditioned to some things in life... that's part of growing up. A child won't find anything wrong with a fish sprouting wings and flying, or fairies painting the rainbow... whereas we know its not true cause we have studied the science of it. That's our first conditioning... the card trick you mentioned is part of the above process, there is a fixed pattern in cards and our mind tricks us into believing that. Whereas when it comes to Subway, I go there cause I like it the best... I don't think its part of the conditioning though. Indeed, from infancy, we are immersed in brands and labels, told what's right and what isn't, indoctrinated by the educational system and, eventually, even told how to think. We associate this with that, which leads us to this and then to that. As you rightly say, we are conditioned to associate different colours with different meanings, and, scarily, we do it subconsciously, without even knowing. It begs the question: to what extent are we our true selves, and not merely the products of a branded society? I cant agree more to this post. We all opt to choose familiar things more often coz we know what we get. As you said may be our brains are used to adapting to familiar things. So how are things at your end Susan? Done with your thesis? You always make me smile from ear to ear with your comments. Sometimes food becomes so personal that trying is not welcome. I see your point about 'first time' and it seems logical but many times the 'first time' is formed quite early in life and it stays there (sometimes forever). Tell me about marketers and ads! Phew! Yes, even with people, it is just the same. I have tried that test as well. The colour one. I passed!!! Love you see you after long, dear Heather. Much love. Yes, the Pablo experiment. Imagine a man instead of a dog!! It is all the same. Tuna-Sub. Yumm!! I have tasted that only once. I wonder when will the time come for getting reconditioned. It will come eventually. It was better a decade ago but today as you mentioned 'right from infancy' this happens. We are the victims and only we can be our own saviours! Getting out of that zone is a challenge we face. It is not as easy. I am glad that you are different, dear one! We shall eat lovely Spanish food and not the Big Macs or whatever. Dulce, what is Spanish specialty in cuisine? I respect You, Susan:). I love your blog and your interesting posts. You inspire me. Thank you for all of your comments; they've helped thrive:).